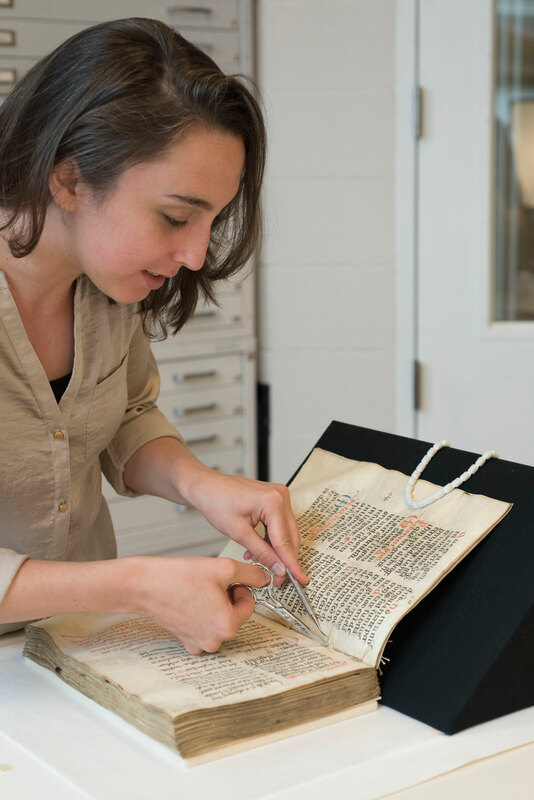 February 2019 – Drew University alumna Catherine Magee recently worked on the conservation of a 12th-century liturgical book linked to St. Francis of Assisi. The two-year effort was “a once-in-a-career project,” Magee told students and professors during a talk at Drew. The book, The St. Francis Missal, is part of the collection at the Walters Art Museum in Baltimore, where Magee C’10 is a Kress fellow and a former Mellon fellow. According to Catholic tradition, Francis opened the book three times at random, and took the biblical passages he found as a sign that he should devote his life to God by embracing poverty. Across centuries, insects ate tunnels into the book’s wood covers and people turning pages left grime on the parchment. One scary moment came when Magee realized that some of the ancient ink was flaking off. She and her supervisor fixed the letters in place with a gelatin mist. The missal is scheduled to be displayed at the Walters in the spring of 2020. Magee’s next project is an 11th-century German gospel. At Drew, Magee majored in art history and classical Latin and and learned the basics of book conservation under the supervision of library conservator Masato Okinaka. Other Drew mentors included Associate Professor Marguerite Keane, who was Magee’s art history advisor, and Professor Kim Rhodes, who helped Magee with a library exhibit that she curated on campus. The subject was early 20th century book bindings that were designed by the Boston-based artist Sarah Wyman Whitman. Magee, who also holds a master’s from the Winterthur/University of Delaware Program in Art Conservation, spoke as part of the Traphagen Distinguished Alumni Speaker Series, which is endowed by Trustee Emeritus Ross Traphagen.